With the official begin of summer quickly approaching, we’ve been having a lot of fun making homemade ice cream again. We’re huge fans of ice cream, and even made it the central theme for Eve’s birthday party one year! My very favorite homemade ice cream continues to be vanilla ice cream with a drop or two of lemon extract, but the kids have loved creating their own ice cream recipes. Here are our favorite egg-free ice cream recipes – no ice cream maker required! What’s your favorite ice cream flavor? Do any of the above three make your list? This entry was posted in Birthday, Food, Kids and tagged Birthday Cake Batter, Cookie, Cookie Dough, Free, Frozen Yogurt, Homemade ice cream, I scream, Ice cream, ice cream birthday party, kid approved, Malted Milk Ball, no eggs, no ice cream maker required, Recipes, we all scream for ice cream, You Scream on June 14, 2015 by fivemarigolds. What could be better than a tutu birthday party for your little ballerina’s two year-old birthday? 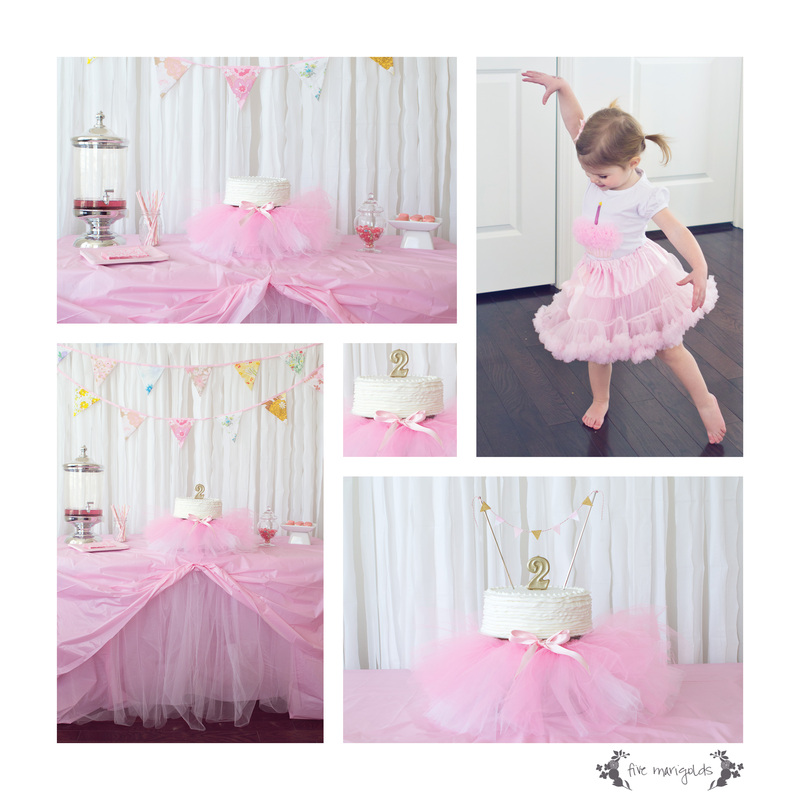 For baby ‘Belle’s party, I wanted to do something that conveyed her love of dancing and tutus and looked special, but that was simple and inexpensive to put together. First, for my $3 backdrop, I took 3 white plastic tablecloths from the dollar store for my backdrop. I simple folded them in half length wise, then began rolling them up toward the fold. Once the cloth was rolled approximately 10″ from the fold, I began cutting the rolled tablecloth in strips approximately 3″ apart. Easy! I finished it off with the vintage bunting we re-use for the girls’ parties each year. I love how this small investment adds something special to every party we have for them. Next, I layered the table with two tablecloths, sandwiched with some tulle. I had planned to make this an inexpensive “tutu tablecloth” but it didn’t quite turn out that way! No problem though – I still love the effect of the pink tulle as the focal point of the table. To finish it off, I placed the tablecloth over the top and bustled it at the center to better highlight the tulle. Finally, I placed a trifle bowl upside down and I placed her own baby tutu around the bowl. Then, I just placed the cake on top. So, I was a little disappointed in the finished result from my local Target bakery.However, I really can’t complain for such an inexpensive cake…and really it looks so cute when it’s all propped out with this gold “2” candle and bunting. 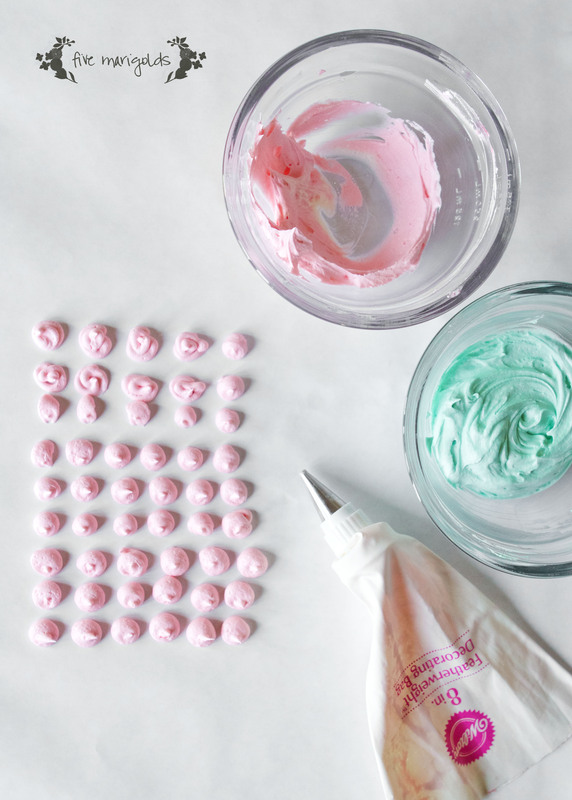 We served ballerina punch, pink Jelly Bellys and dipped marshmallows for a birthday-worthy sugar buzz. I hope you like ‘Belle’s tutu party fit for a two year-old ballerina. Thanks for stopping by! 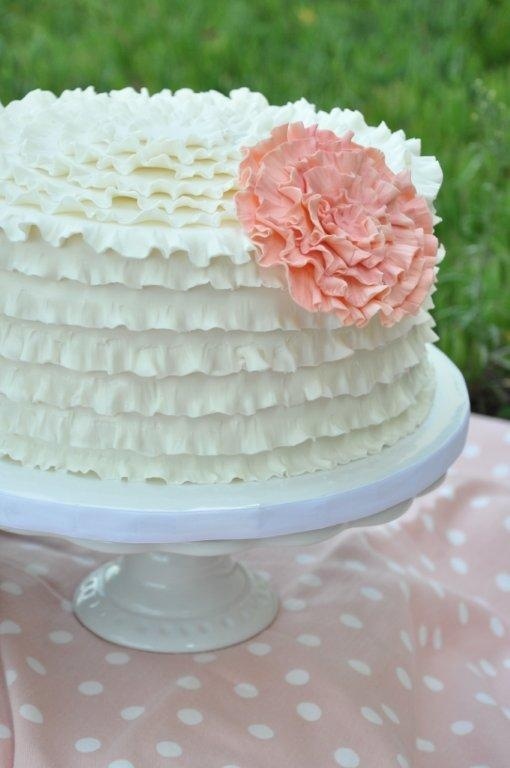 This entry was posted in Birthday and tagged 2, ballerina, Birthday party, Budget, Bunting, dancer, diy, dollar store, frilly, Jelly Belly, lace frosting cake, Pink, Target, tulle, tutu, two, vintage bunting on March 30, 2015 by fivemarigolds. This year, Dub wanted his birthday to be all about Minecraft. He’s also really into Legos, so a Lego Steve seemed like an appropriate favor for the goodie bags. I did a lot of research trying to find an easy way to to this. To be honest, I was hoping there would be a sale of Minecraft Lego lots on ebay that would allow me to phone this one in, but it was not to be. So, I ended up making Steve myself using the Lego Pick-A-Brick feature. While you can do this in-store if you have a Lego retail location near you, they have a varying selection, so I saved myself the trip and did my shopping online. This is where I insert my Lego PSA – I found out after I placed my order that Pick-A-Brick orders can take up to 18 business days! That’s almost a month! So, this favor only really works if you are planning out by at least a month to ensure your Bricks get to you in time. Then, I went to work making a face for Steve in PhotoShop. I measured it to the size of the 2×2 Lego and then I printed it on Avery label paper. Removing the paper backing first, I cut down each face sticker to the exact size and then replaced it on a small square of the paper backing to place in the favor bag. I took a photo of the complete Steve to include with all the kits. I placed the Legos in a small jewelry ziplock bag. Then, I made a simple tag that I stapled to the top of the sealed bag as a finishing touch. This was a huge hit among the 6 and 7 year old crowd! 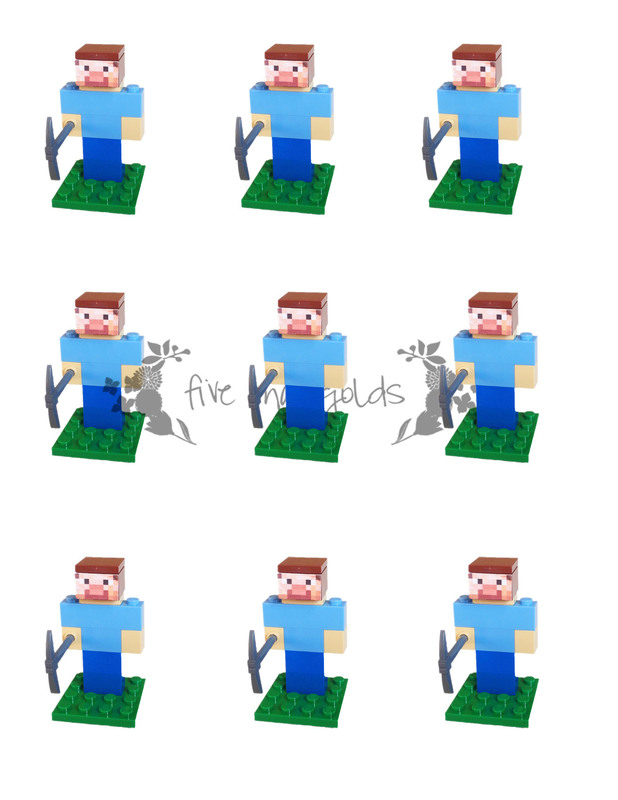 Thinking of making a Lego Steve for your Minecrafter’s party? You can get a head start by downloading Steve’s face here (compatible with Avery 5260* labels), the finished Steve image inserts here, and the favor tags here. Enjoy! *Please read my affiliate link disclaimer in the sidebar. 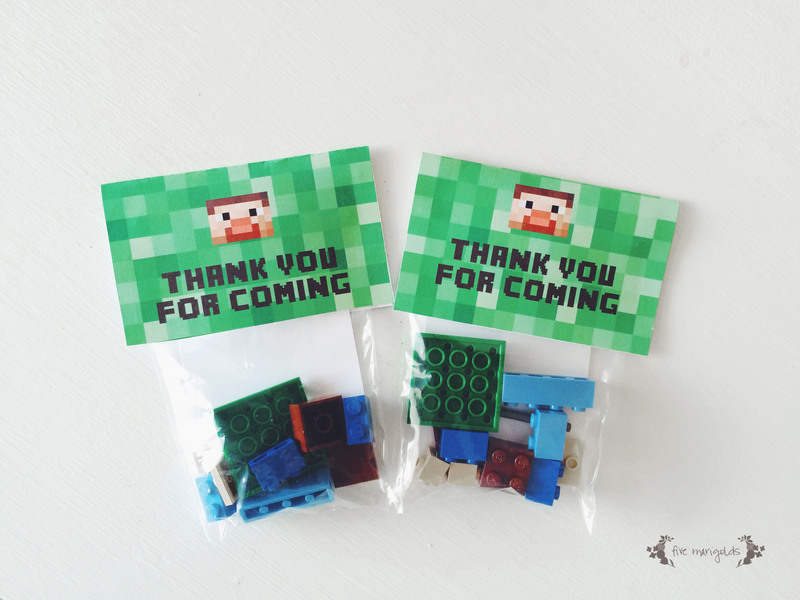 This entry was posted in Birthday, DIY, Kids and tagged birthday, Birthday party, Free Download, goodie bags, Lego, Minecraft, Party favor, PhotoShop, Pick A Brick, Printable, Steve, thank you on March 20, 2015 by fivemarigolds. 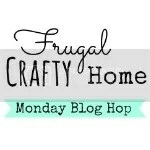 I absolutely love the look of these tinsel tassel banners for party decor. Even better? They’re super easy and inexpensive to make. Dub really wanted a Minecraft-themed birthday party, but I didn’t want a licensed decor explosion, so I began thinking of ways to decorate with color. With lots of Pinterest inspiration, I decided I wanted to give this a try. However, I was surprised to find there aren’t a lot of tutorials out there so I am sharing a quick and dirty tutorial of my own. I set to work on this particular banner with four colors of tissue paper, green, lime green, chevron and silver metallic (I linked to some examples because I initially had a hard time finding these). 1) First, I took a stack of 8 sheets of tissue in each color and cut them the short length of the pre-cut sheets (approximately 20″) and cut them about 8″ wide. 2) I then folded the stack of sheets in half and began cutting them in 1/4″ strips, stopping about 1″ from the fold. I used a rotary cutter and mat to make quick and more precise work of this, but regular scissors will do. 3) I then unfolded the papers and, taking 2 sheets at a time, began rolling them tightly at the center. Once each set of 2 was rolled at the center I began gently twisting the rolled portion. Once it was lightly twisted I folded it in half and began twisting the rolled portions together. When you’re done it will look something like this. Perfectly imperfect. 4) Thread the tassels through a string or ribbon. I made a single simple knot at each tassel to keep them in place. All in all, this was a pretty quick and easy project that took me maybe 20 minutes total to complete. I also love that if you source your papers from the dollar store, you could complete three of these banners for just $4! (meaning, each banner is just over $1, with plenty of paper to spare for favors or gifts). I have a feeling various themed tinsel banners will be showing up at more parties around here! Dub’s party is not for a few more weeks, so I’m letting it hang on our mantle for St. Patrick’s Day. How’s that for multi-purpose party decor? *This post contains affiliate links. 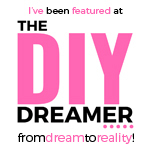 Read more about about affiliate links in my sidebar. This entry was posted in Birthday, DIY and tagged amazon.com, Banner, birthday, Birthday party, Budget, Bunting, cheap, decorations, dollar store, Minecraft, party decor, Poms, St. Paddy, St. Patrick's, St. Patrick's Bunting, Tinsel, Tissue Paper, Tutorial on March 7, 2015 by fivemarigolds. 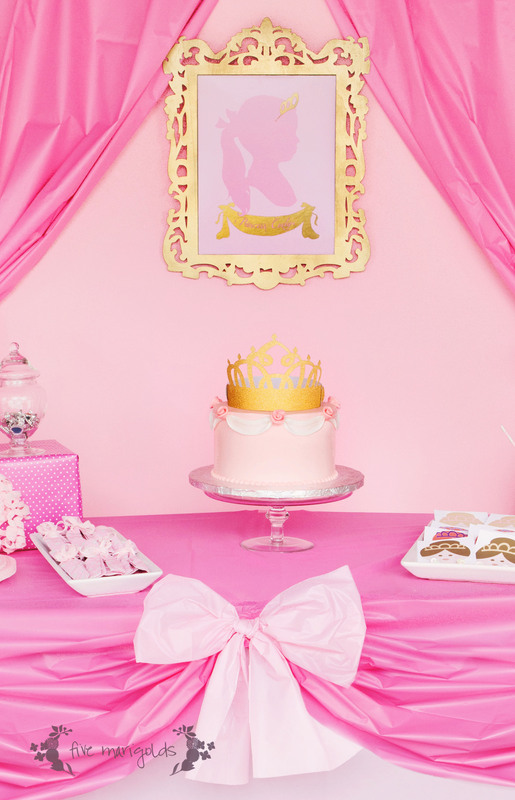 It’s official: Eve is 4 years old, and she had a birthday party fit for a princess. You’ve already seen the custom favors I prepared here and here (for less than $2 total! ); now take a look at the rest of the party. We created an extremely inexpensive table setting by purchasing five plastic tablecloths in two different colors from the dollar store. You can replicate the look by using one color of tablecloth for your backdrop and base tablecloth. Then, use the three contrasting tablecloths to create the “curtains” and top tablecloth. I Cut 12″ sections from the bottom of the curtains for the bows. Then, I bustled the uppertablecloth and secured it with safety pins. 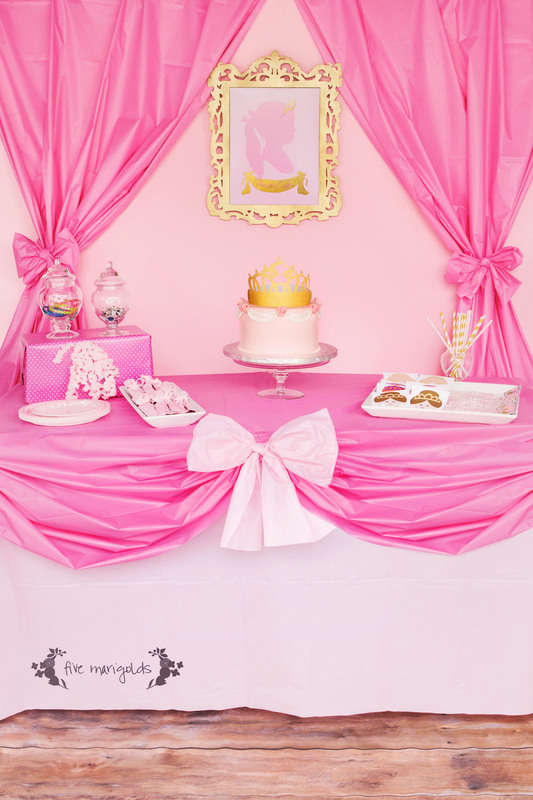 I used a 12″ strip of the base tablecloth to create the bow on the table. Voila! A super cute tablescape for just $5. Next, I created a custom Princess Silhouette. Remember the silhouettes I made for the girls’ room? I made an easy modification in PhotoShop by making the background and silhouette our party colors. I labeled it “Princess Eve” using my favorite Jellyka Delicious Cake font. This time I had it printed at Costco for just $2.99 and reused the frame we scored at JoAnn’s for $3.99. Make two folds on your napkin so the two outer edges meet in the middle. Then fold it one more time so that those two folds now touch back-to-back (and the side with those original outer edges is face out). On the folded side, cut a “V” into the napkin. Secure with a bow or glue a small piece of paper to secure, if desired. That’s it! A festive napkin ring for no additional cost than the napkins and tableware you would have already supplied. The center of attention on our Princess Party table setting was a sweet princess cake I got from our local bakery, Sweet Pea Cakes. I then topped it with a gold paper tiara I made using scrapbook paper from JoAnn’s on my Silhouette SD. Like the ideas you see here? Take a moment to tell me about it below! This entry was posted in Birthday, Kids and tagged birthday, diy, dollar tree, Dress Napkins, Easy, Gold, Inepensive, JoAnn's Craft Store, party, Pink, Princess, Princess Napkin Rings, Setting, Silhouette SD, Sweet Pea Cakes, Table, Tablescape, Tutorial on August 4, 2014 by fivemarigolds. For Eve’s Princess Birthday Party, I was going for a generic princess feel rather than a Disney princess kind of feel. As part of that, I wanted to create some custom party favors. I didn’t really find anything out there I loved for purchase, so I went about creating my own. You already saw the Candy Button Crown favors I made for the party. Today, I’m sharing the hit of the party – Candy Necklace Cards. I’d seen a similar concept online, but nothing princess themed. So, I went about creating these myself in PhotoShop, using hair and dress colors that somewhat inspired by Disney princesses, but with look that still felt sweet and unbranded. I love how they turned out. On the front I printed these sweet princesses on heavy cardstock. On the back, a thank you note for attending Eve’s party, written in Jellyka Delicious Cake font. I simply cut a slit on each side, then hooked the candy bracelet on the card. The best part? This favor is very inexpensive – 10 favors for just $1 when you buy the candy bracelets from the Dollar Tree candy section, like I did. Or, buy them in bulk. You can package them in clear cellophane from the craft store. I have no shame in sharing that I’m already planning to recycle these babies for Valentine’s Day cards, bagged in cellophane . What do you think? Would your little princess love to receive these as a party favor or Valentine? Would you like a printable copy of this for your little girl? 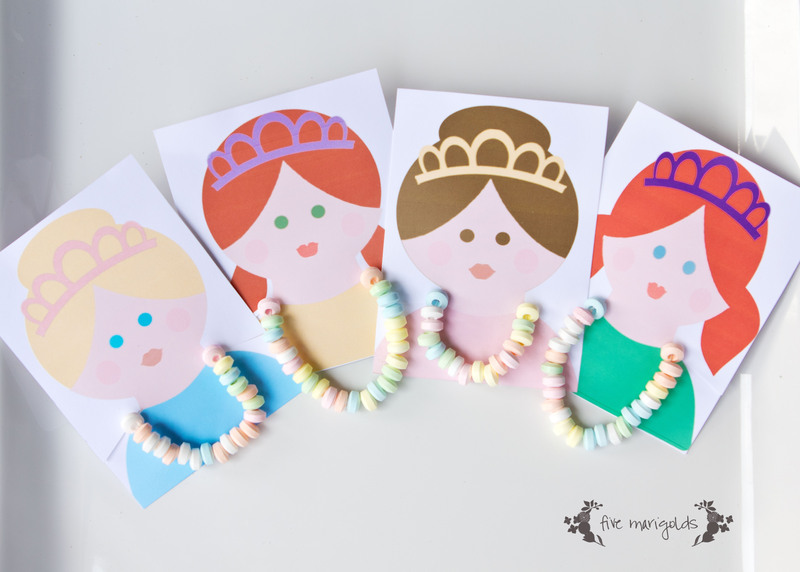 UPDATE: Download the free Princess Party Candy Necklace printable here! I would love to see these printables in action. 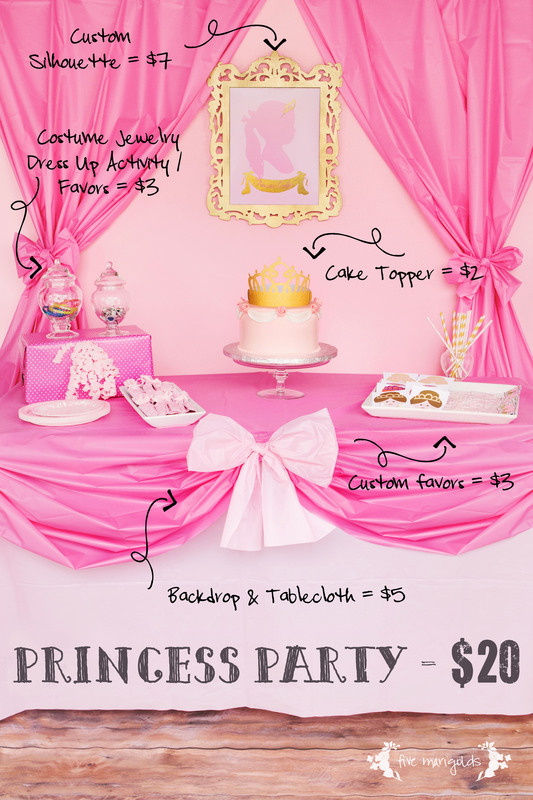 Please be sure to send me images of your princess parties! This entry was posted in Birthday, Design, DIY, Valentine's Day and tagged Birthday party, Budget, Candy Bracelet, Candy Necklace, Cinderella, diy, dollar tree, Easy, Free, Free Download, free printable, freebie, Girls, goodie bags, inexpensive, Party Favors, Princess, Princess Party, Princess Valentine, Printable, Valentine's Day, Valentines on July 31, 2014 by fivemarigolds. We’ve established that I’m a big fan of ice cream. But, cake. Oh how I love cake, too! Eve chose Birthday Cake ice cream as one of her flavors for our ice cream truck and it didn’t take me any convincing to agree. I set to work researching recipes, but yet again found that most recipes called for eggs, which was not what I was going for. 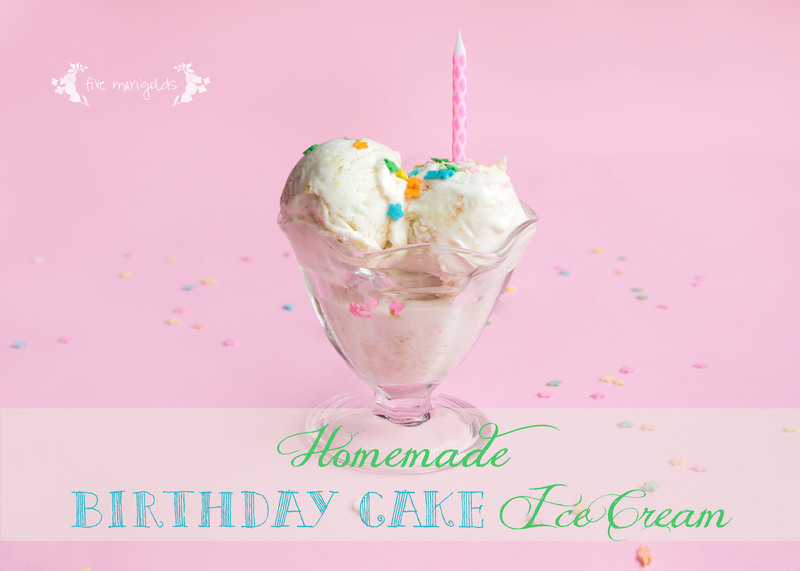 So took my favorite ideas from the interwebs, then adapted a basic vanilla ice cream recipe to create this fabulous birthday explosion for the tastebuds. Reserve half of your cake mix, and prepare the remainder in an 8″ or 9″ round pan. When it’s done, remove it from the pan and place it in your freezer. Place small drops of buttermilk icing on a small sheet of freezer paper, and then place it in the freezer to set up. I used an icing bag and a small round tip to make mine uniform because I was photographing it, but you don’t need to make these pretty. I also colored my icing to make it festive and pretty. Mix the milk, sugar, and 1/2 C. cake mix until the sugar and mix are dissolved. Stir in the heavy cream and vanilla, and place the mixture in the fridge. Cube 1-2 cups of the frozen cake into the size of croutons. Place the liquid mixture into your ice cream maker* about 20 minutes until it thickens. Then, slowly pour the 1-2 cups of cake cubes and desired sprinkles into the machine until it is lightly mixed. Place the mixture into a sealed container in the freezer for at least 2 hours or overnight. *No ice cream maker? No problem. Freeze the chilled liquid mixture for 2-4 hours or until slightly thickened/frozen and then gently stir in the cake cubes and sprinkles. Chill overnight. YUM! Your kids will beg you to make this recipe again and again. I hope you enjoy this recipe! Please tell me what you think in the comments below. This entry was posted in Birthday, Family, Food, Kids and tagged Birthday Cake, Buttercream, Cake Batter, Entrepreneur, Five Marigolds, Funfetti, Ice cream, Kidpreneur, no eggs, Recipes on July 28, 2014 by fivemarigolds.